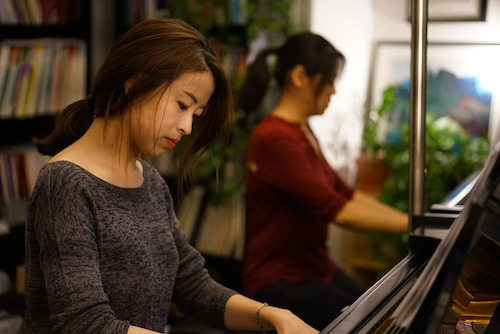 Jessica Lee (left) and Pei-Chen Chen (right), Graduate students in Piano, play a Rachmaninoff piece after warm-up exercises on the PBT. With the physicality of performance, musicians can be vulnerable to pain or musculoskeletal disorders. An increased awareness of balance and posture can certainly help mitigate this problem, yet, when a performer is under stress, awareness of body and balance can easily be neglected. Midori Koga, Associate Professor of Piano and current Associate Dean of Graduate Studies for U of T’s Faculty of Music decided to address this problem. In collaboration with Professor Jun Nogami, Materials Science and Engineering, Midori consulted with faculty members in music, engineering and kinesiology and came up with a technology supported solution. This led to obtaining an ITIF grant (Instructional Technology Innovation Fund) in 2011 and the development of the personal balance toolkit (PBT). The grant helped enable the purchase of the necessary equipment and the services of both a software developer (Nelson Toh a graduate engineering student) and a project manager. The PBT facilitates a greater awareness of posture; which in turn can free musicians from posture-induced pain and can enable greater musical expressivity. Currently the PBT is used mainly during warm-up exercises, before playing one’s instrument. The musician starts by stepping onto the balance board. The balance board is made up of pressure sensors which measure the user’s center of balance. After calibrating the board, a diagram on the screen displays the musician’s center of gravity and provides feedback as they mimic the movements of playing their instrument while standing on the balance board. This helps the musician shed any extraneous muscle tension and become grounded in the posture and gestures involved in playing their instrument in optimal form. In 2013, Midori ran a small scale assessment of the PBT. She observed 10 students (5 pianists, 2 percussionists, 2 voice students, and 1 flutist) over a period of a month and worked with each of them individually. Students filled out a questionnaire after the sessions to indicate their level of comfort and awareness in regards to balance, breath, release of tension, ability to audiate (sing through the notes they will be playing), and the overall effects the PBT exercises had on their performance. Based on Midori’s observation of the students playing their instruments, the results of the questionnaire, and direct feedback from the students, they benefited tremendously from this practice of warming up with the PBT. 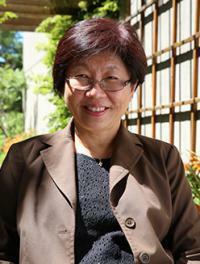 Professor Koga herself also used the PBT in her teaching and playing. She remarked, “I can hear the difference in tone quality and have noticed an increased physical ease when playing the piano.” She has continued to use the PBT in her teaching studio and in her graduate piano pedagogy coursework as recently as the spring and fall of 2017 because the principles of mental and physical balance are so critical in musical performance. 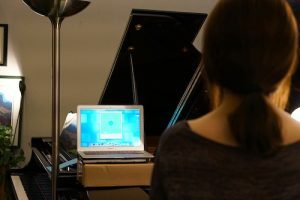 Midori has delivered hands-on workshops on this balance-focused approach for various music performance students and has led demonstrations of the PBT at a number of conferences and symposia. In May of 2014, she took the PBT to Stanford University, where she worked with Professor Takako Fujioka in her Motion Capture Laboratory at the Centre for Computer Research in Music and Acoustics (CCRMA). After observing Midori work with students on the PBT, Professor Fujioka, also a pianist, expressed interest in how the PBT could enhance awareness of healthy movement for pianists. Together they conducted a 3-day pilot program of using the PBT for pianists from Stanford. They intend to continue this collaboration following Midori’s term in administration (as the Associate Dean, Graduate Education for the Faculty of Music). In 2016 she presented at U of T’s Sounds of Science Symposium with a poster and the PBT. They invited observers to step on to the balance board and perform a few of the PBT exercises. Many of those who tried the PBT commented that they could benefit from something like it at their workplace as it could help them focus. Midori is interested in exploring the potential of the PBT in other non-music uses; perhaps in hospitals, senior residences, or other workplace settings. This innovation is a marvelous support for musicians as it recognizes that success in music extends well beyond mastering the theory, and proficiency in performance. In providing an enhanced awareness of their body while playing music, the PBT not only enables their best performance, but fosters a healthy approach to practice.